On the distant Saturn moon Titan, methane takes water’s liquid role: is life supported there? Until we know the answers to such universal questions, we can only observe the cautionary rule of water’s crucial role for humanity’s ecological survival, and act upon it decisively with speed. For fresh water resources on Earth are finite and rapidly shrinking – consumed in the proportion of seven times the urban development rate. 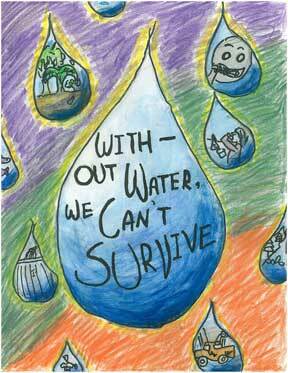 Water crisis is upon our world; equity action is urgent. Read Water: The Epic Struggle for Wealth, Power, and Civilization 2010 by Steven Solomon, and further. From Mahon’s book – about the Hurunui River struggle mainly – the 2007 Canterbury water politics become visible, the context into which Save Our Water was born and proceeds today. Mahon’s book covers the 2004 WeCan campaign for Canterbury Regional Council / Environment Canterbury / ECan seats, that polled quite well but did not secure any. Other record or evidence of WeCan is hard to find, and depends upon first-hand, subjective accounts. Save Our Water succeeded in 2007 because a very few WeCan participants, and some new ones, resolved to fix the problems of 2004 that Mahon partly documents. The main difficulty faced by WeCan in 2004, that Save Our Water managed to solve in 2007 for electoral success, was that of merging and balancing political party hierarchy – fueled by intensely competitive, career-oriented politicians – with the more everyday activism of a much wider, more diverse, creative and fun-oriented public. Green Party dynamics in Canterbury have been very thoroughly tested by the water experience. Revealed was that, despite high-sounding principles, the Green Party acts much the same as most other parliamentary parties – where hierarchy and brand power mean far more than an honest search for effective socio-economic solutions on the ground: other, centralist and image priorities impose. It has become clear that whereas Greens want to be involved, and to look active in their local focus, they have no real means on offer for stemming the deleterious transformation of landscape by industrial agriculture. Riparian planting, fencing and nitrogen-stabilising (earth sterilisation) policies may have small beneficial effects on water and gas pollution rates, but can never address the whole problem effectively. A concerned public should notice this policy deficit. The ability to fight this battle is bureaucratically and conservatively held in check, to actually fail. Not until the Green semi-monopoly on environmental representation is broken will progress for people in harmony with environment be made. They, like all national parties, do not belong in local body politics; of course the reality is the inverse, as it turns out. A major political difference was over the advocacy of water meters and volumetric charging for domestic users, that Green Party policy encourages as water conservation means, which Save Our Water candidates had a democratic right to argue against locally – as being unjustified overkill and wastefully expensive to implement in Christchurch. But debate was systemically stifled rather than held, with unthinking Green conformism to the central Party line rigidly applied – aside a harmful stigma campaign. Separation of this local water campaign was bureaucratically imposed. In 2010 the Canterbury Green administration abandoned principle – and Rod Donald’s 2004 policy of separation based upon bad STV electoral reform experience – by rejoining the 2021 local election campaign. With nil consultation with its membership, the Green ‘democratic leadership’ in Christchurch thus has proved fully moribund – sacrificed to vapid, careerist expediency. They were more prepared to lose to a Conservative son on the crucial water quality issue, than they were to stand up to Labour and its appalling record in this area, to edge closer to local seat-warming. A shocking performance at heart. The battle for Canterbury water quality continues, and requires steadfast analytic clarity with substantial policy alternatives.